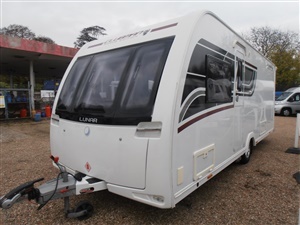 4 Berth, Heating, Hot Water, Leisure Battery, Mains, Roof Light, 3-Way Fridge, 4-Burner Hob, Grill, Hob, Kitchen, Oven, Side Kitchen, Cassette Toilet, Fixed Bed, Hand Basin, Rear Washroom, Wardrobe, Blinds, Carpets, Curtains, Door Screen, Fly Screen, Flyscreens, Hitch Head Stabiliser, Loose Fit Carpets, Motor Mover, Lunar Clubman SI Saros Edition. Beautiful Spacious 4 Berth Fixed Island Bed. Weight 1340 Kilo, Length 18.92Ft. Berth 4, Year 2014. 2 Singles at the front that transfer into 1 double bed. Center kitchen with 3 way fridge, Oven, grill and hobs. Fixed Island Bed with storage underneath. End washroom with Hot and cold water. Seperate shower, casette toilet and hand basin, 12/240 Mains electrics, Alde heating system. Removable carpets, Remiflair blinds, flyscreens and curtains. Larhe rooflight, LED Lighting, Alko Stabiliser hitch and lock, ATC Fitted, Gas bottles, Powertouch motor mover fitted.